Ports-to-Plains continues to work hard to extend Interstate 27, and we continue to see progress in those efforts. HB 869 by Rep. Dustin Burrows and its companion bill SB 1034 by Sen. Charles Perry would authorize TxDOT to conduct a feasibility study to extend I-27. The Senate Transportation Committee unanimously reported out SB 1034 March 30 and recommended it be placed on the local and consent calendar. HB 869 has been referred to the House Transportation Committee and awaits its hearing there. Rep. Burrows and Sen. Perry hosted a legislative briefing on their bills at a meeting March 30 to discuss I-27 with legislators and their staffs. A delegation from Ports-to-Plains communities including mayors and other community leaders from Lubbock to Del Rio also attended. The PTP group visited other legislative offices and delivered a packet of support resolutions from member communities, civic groups and letters from individuals. Ports-to-Plains will continue our efforts at the federal level with our Washington Fly-In April 24 – 28. Our staff and board will visit with our members of congress and discuss issues relating to transportation, trade, agriculture and energy. Your support is still needed. 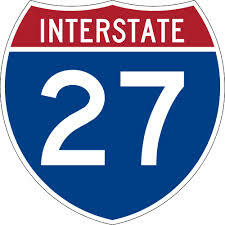 If you have not already done so, contact your state and federal legislators and tell them that you support extending I-27. Most have a simple form on their websites where you can quickly submit an email. Congress is also in recess this week so do not pass up the opportunity to meet your congressman or senator in person if they are holding public meetings near you. Trump Infrastructure Plan... Could it come to the forefront? Is Trump hitting reset on the NAFTA criticism? Congress has already designated the Ports-to-Plains Corridor in Texas as a High Priority Corridor on the National Highway System. Republican State Senate President Kevin Grantham is a co-sponsor of the most significant transportation bill in Colorado for a number of years. Senator Grantham gives a great overview of the bill as it enters the Colorado Senate for consideration after passing the Colorado House. Thank you to Senator Grantham and Senate Committee on Transportation Chair Randy Baumgartner for their leadership on this bill. Here is the latest installment in the ongoing effort to keep you informed about critical issues here at Dome to Home. One of the most pressing issues is transportation funding as addressed in HB 17-1242. I wanted to give you the facts and rationale behind it and then you can decide for yourself whether you like this proposal or not. As of right now the bill has passed the final vote in the House with bipartisan support and is on its way to the Senate Transportation committee. Several amendments were passed which goes to show that this bill is a work in progress and amendments mean opinions about solutions are being explored and accepted. I’m especially pleased with Representative Jon Becker’s amendment in Transportation committee to eliminate the FASTER vehicle registration late fees which is burdensome, especially to rural citizens. There was a lot of testimony on this bill and I’m very grateful for that and am looking forward to this discussion as the bill progresses. About the bill itself, it is all about consent of the people, transparency, accountability, and deliberate, purposeful spending. This bill is not the end of the conversation but the beginning of a more difficult conversation with new ideas and many hard discussions. This bill is not perfect and has many things that both sides find disagreeable if not unacceptable. It is a work in progress and gives us a framework for discussion and the possibility of actually getting something through two diverse chambers, signed by the Governor, and approved ultimately by the voters of Colorado. We could have proposed a bill or series of bills that could swiftly pass the Senate and then promptly die in a House committee. That is easy. But if we actually want to see real change for your transportation needs, if we want to see something of substance done, then we have to do the difficult things, the tough things, to make a difference. That is why I have proposed this legislation which I believe is our best chance of success to solve the infrastructure and traffic issues seen and felt by each and every one of us. So what is this bill? First and foremost this is a ballot question to be voted on by Coloradans. It’s important to me that the citizens of this state get a say not only on whether they will increase their taxes but also on where their money is being spent. It is important also that we remain constitutionally compliant in that we ask for your permission to do this. This proposal keeps faith with taxpayers by complying with both the letter and spirit of TABOR. The Ports-to-Plains Alliance Washington DC Fly-in may be well timed as the discussion on Preisent Trump's infrastructure plan may be nearing the table. House Transportation and Infrastructure Committee members say they are eager to focus on infrastructure spending. Barletta said the panel would hold an initial hearing on the proposal for members to help offer input on the bill. Sen. John Thune (S.D. ), the Senate’s No. 3 Republican and chairman of the Senate Commerce, Science and Transportation Committee, said the upper chamber would be willing to move on Trump’s legislative priorities in whatever order they come. Democrats had hoped the one big policy area they could find common ground with President Donald Trump on was infrastructure, but they don’t like what they’re hearing from administration officials about the transportation portion of the plan that’s still in the works. Trump has promised to generate $1 trillion in infrastructure spending over 10 years. With two of his other top campaign pledges in trouble — an effort to repeal and replace the Obama administration health care law has failed so far, and without savings to the government from health care changes there may not be enough money to pay for lowering tax rates — infrastructure appeared to be an area ripe for bipartisan compromise. But some Democrats say they worry that Trump’s plan will focus on trying to entice more private investment in transportation projects and reduce regulations that require environmental reviews and community consultation on projects rather than providing more government money to repair, replace and expand the nation’s transportation network. Reps. Peter DeFazio of Oregon and Eleanor Holmes Norton of the District of Columbia, two top Democrats on the House transportation committee, sent a letter Wednesday to Transportation Secretary Elaine Chao objecting to comments she made last week about the failure to fix the nation’s crumbling transportation system. Adopting “keep it in the ground” policies that antifossil fuel activists advocate could make the average US household’s energy costs jump $4,550 in 2040 from increased transportation fuel, electricity, home heating, and goods and services costs, a study commissioned by the American Petroleum Institute concluded. “While 80% of American voters support increased US oil and natural gas production, a vocal minority are working to obstruct energy development and infrastructure projects, reducing our energy options under a false belief that oil and gas production and use are incompatible with environmental progress,” API Pres. Jack N. Gerard said on Apr. 4 as the trade association released the report. He said API hired OnLocation Inc., a Vienna, Va., firm with more than 20 years’ experience providing technical support for US Energy Information Administration modeling, to conduct the new study. It used EIA’s own economic model software and the identical base case inputs from its 2016 Annual Energy Outlook to explore what would happen if the US halted new federal oil and gas leases, banned hydraulic fracturing, prohibited new or expanded coal mines, and stopped issuing permits for energy infrastructure, including pipelines and import/export facilities, Gerard said. Trade is complicated, especially when it involves the North American Free Trade Agreement. Perhaps President Donald Trump has begun to appreciate that, as he did with health care. That would be heartening for Texas and our most important neighbor, Mexico. Texas, the nation’s top exporting state, sent almost $93 billion in exports to Mexico last year. That’s 40 percent of the state total and over four times more than to Canada, our other NAFTA partner and next-largest export market. 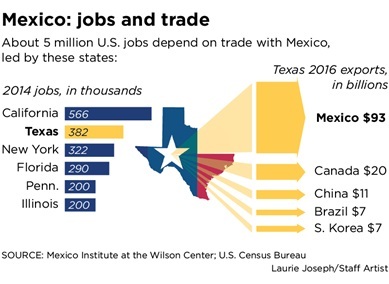 Texas also imports the most from Mexico: $81 billion last year, over twice as much as from China. Trade is a key part of the Texas economy, and the Dallas and Houston areas are major players. So when Trump won the election in November, there was reason for concern. During the campaign, he frequently criticized Mexico and NAFTA. He called the agreement a disaster and the single worst trade deal ever approved in this country. He said the U.S. was being "defrauded." But the Trump administration appears to have softened. It recently circulated a draft letter to update NAFTA and the proposals didn’t sound like Trump’s campaign rhetoric. They seemed aimed at improving the agreement, not scrapping it.